Miele’s fully automated WT1 washer-dryer takes care of the entire laundry process for you, giving you more time for other things. Doing laundry has never been so enjoyable and hassle-free. You no longer need to worry about how much detergent to add, or when. The TwinDos detergent dispensing system considers the load size, content and selected programme of the load, then dispenses UltraPhase 1 and UltraPhase 2 detergents for unparalleled cleaning performance in exactly the right amount at exactly the right time. This gives you perfect results and actually uses 30% less detergent than manual dispensing1. Caring for your special garments, Miele’s CapDosing system cleans a variety of fabrics to a professional standard, including wool, silk, down, sport and outdoor clothing. With the highly efficient QuickPower programme, you can save a considerable amount of time. The PowerWash 2.0 process with Spin & Spray technology wets the washing more quickly using the spray action, as well as save energy. 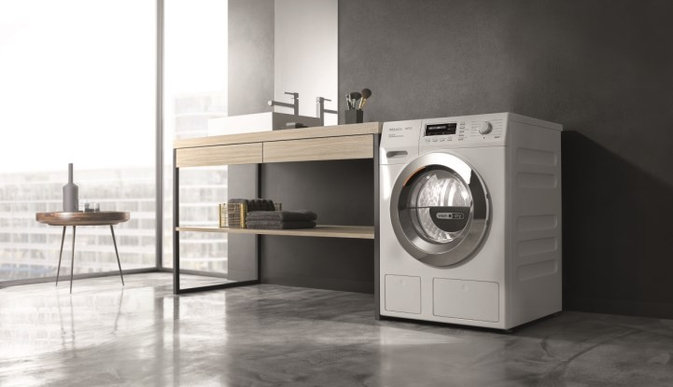 In just 3 hours, the highly efficient machine washes and dries 4 kilograms of laundry2, while the XL model can handle 5 kilograms in a little less than 3.5 hours. Ironing is 50%3 quicker with the SteamCare function, or not necessary at all. Manufactured in Germany with advanced technology, the WT1 embodies Miele’s superior technology, quality and durability. Saving time and effort while heightening cleaning performance, it is tested to the equivalent of 20 years of use. What’s more, a combined washer-dryer saves significant space in your home. Available at the Miele Experience Centre in Causeway Bay, Miele Experience Zones and our retail channels, any purchase of a new Miele WT1 TwinDos washer-dryer4 comes with vouchers for a year’s supply of UltraPhase 1 and UltraPhase 2 detergent5, in addition to the free bottles that come with the machine. It’s time to discover just how convenient laundry can be. 1 Tested and certified by Öko-Institut e.V. 2 Applicable to the 7-kilogram model. The 8-kilogram model requires 3.5 hours. 3 Certified by the home technology department of the University of Bonn. 4 This special offer only applies to the WTH 120 WPM or WTZH 130 WPM models, and is valid until 31st August 2017. Deliveries must be made by 30th September 2017. 5 A complimentary voucher will be included for redeeming the Miele UltraPhase 1 (6 pieces) and the UltraPhase 2 (4 pieces) detergents via Miele Hong Kong webshop. Annual detergent requirement is based on 250 wash loads per year.